Situated on the opposite side of Interstate 95 from Downtown Jacksonville, Durkeeville is a historic neighborhood less known and promoted than its neighbors to the east and south. Also known as Mid-Westside Jacksonville, this neighborhood is the result of the growth and prosperity of Jacksonville's African-American community during segregation. 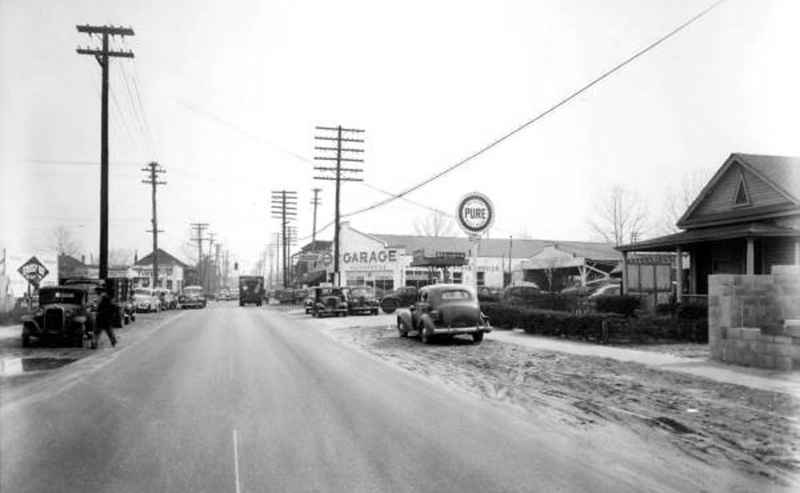 Kings Road through Durkeeville in February 1948. Courtesy of State Archives of Florida. The area of Jacksonville known as Durkeeville largely owes its existence to the establishment of the North Jacksonville Street Railway, Town and Improvement Company in 1902. Called the “Colored Man’s Railroad,” this black-owned streetcar system connected Northwest Jacksonville with downtown, using Kings Road, Myrtle Avenue, 13th Street and Davis Street to form a transit loop north of LaVilla. Opening ceremonies were held on August 24, 1903 at Mason Park with several dignitaries, including Mayor George M. Nolan and former Mayor Duncan U. Fletcher, giving speeches. Owned by the streetcar company, Mason Park was situated at the present day site of Stanton College Preparatory School near Myrtle Avenue and West 13th Street. 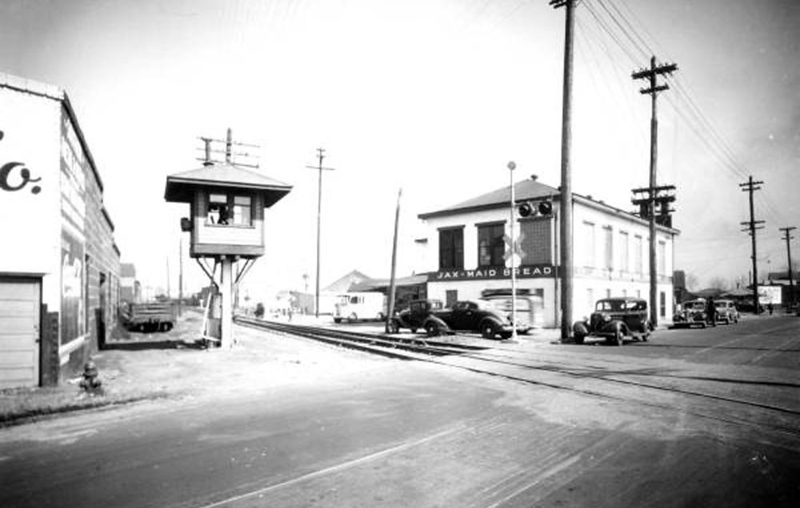 The Kings Road Seaboard Coast Line Railroad (S-Line) crossing on February 2, 1942. Courtesy of State Archives of Florida. The streetcar routes grew to be one of the city’s most used, stimulating African-American oriented transit oriented development along their path in Durkeeville, LaVilla, Sugar Hill and Hansontown. 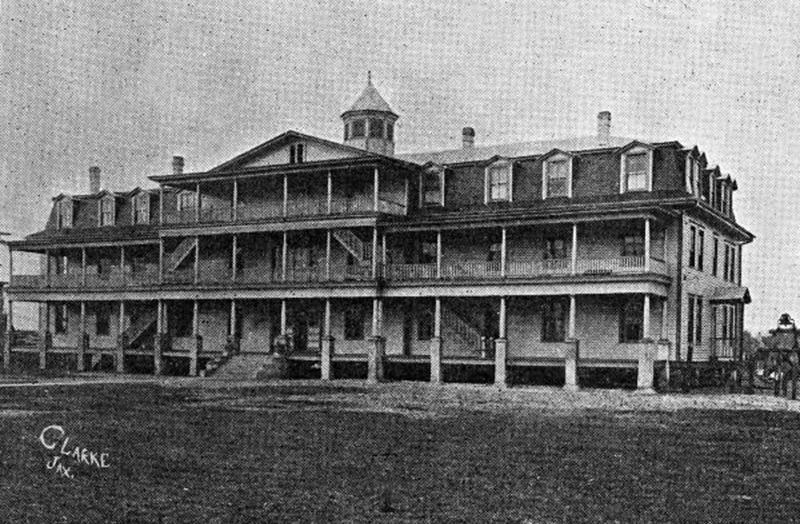 Within a few years after its opening, the Cookman Institute (now Daytona Beach-based Bethune-Cookman University) and Edward Waters College had relocated their educational campuses near the line. 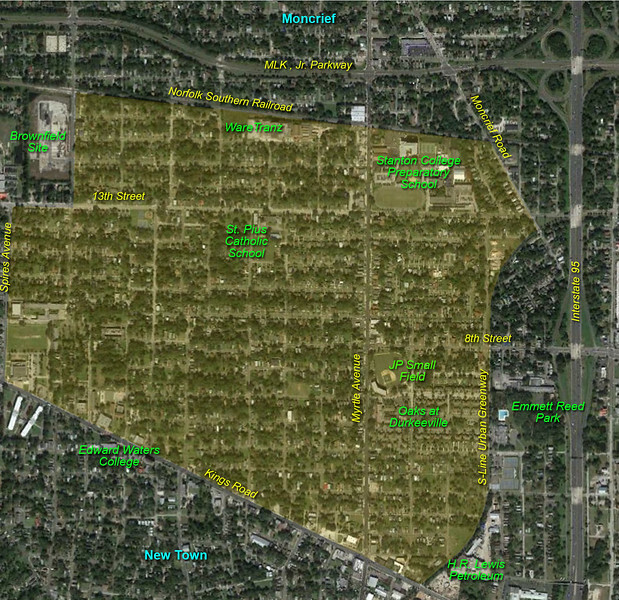 By the end of the Florida Land Boom, the portion of neighborhood south of West 8th Street had largely built out as a walkable district filled with a large collection of small multifamily dwellings. Edward Waters College was founded in 1884. Courtesy of State Archives of Florida. At the time, a significant plot of land north of the neighborhood’s Barnett’s Subdivision plat was owned by Dr. Jay H. Durkee. Durkee was a prominent real estate developer and son of Union military officer Joseph Harvey Durkee. Originally from New York, Durkee settled in Jacksonville after the Civil War. The Durkee family initially envisioned their property being used for industrial and railroad related uses adjacent to the new Seaboard Air Line (SAL) Railroad. At one point, to stimulate industrial growth, a rail spur was extended to Myrtle Avenue just south of West 13th Street. After those plans failed to materialize, much of the property was platted to accommodate Jacksonville’s rapidly growing African-American middle class. In 1937, the Public Works Administration completed the 215-unit Durkeeville public housing development just south of West 8th Street between Myrtle Avenue and the SAL Railroad line. This was immediately followed by the development Durkee’s remaining property into an upscale African-American subdivision roughly bounded by the public housing development, the SAL railroad, 13th Street and Whitner Street. Through the end of segregation, Durkeeville was home to Jacksonville’s prominent African-American physicians, educators, business people and religious leaders. Aerial and locator map of Durkeeville in 1943. 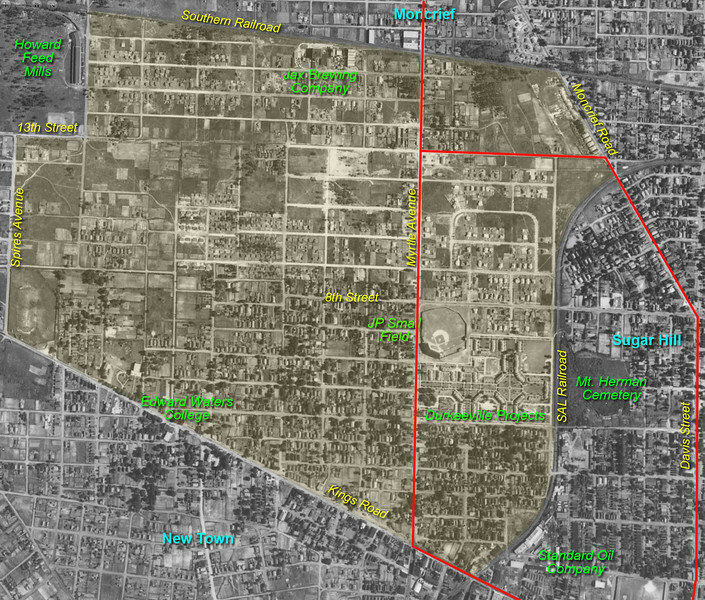 The red lines represent the neighborhood’s streetcar routes that operated from 1903 to 1936. The southern section of the neighborhood between Kings Road and West 8th Street, platted as Barnett’s Subdivision, was largely built out by 1930. With many of its homes designed and built by African-American contractors James Edwards Hutchins and Sanford Augustus Brookings, the neighborhood’s collection of mid-century red brick structures continue to create a unique contextual look and environment just west of Historic Springfield and Interstate 95. While discussion about Durkeeville in the preservation and architectural community may be lacking, a drive down the neighborhood’s streets and a look into its past reveals an intact historic pedestrian scale district the city should embrace. In honor of Black History Month, here’s a look at a historic urban core neighborhood worthy of significant recognition. A Google Earth aerial and locator map of Durkeeville in 2018. While the construction of Interstate 95 in the late 1950s destroyed neighboring Sugar Hill, being “out of sight, out of mind” to urban renewal gimmicks has resulted in an early 20th century historic African-American community virtually remaining in-tact.